It’s high time to make the switch to the more approachable, full-featured Swift for all your custom iOS app development. In this article, we’ve compared Objective-C with Swift, a modern programming language for iOS development, and listed the reasons why Startups & Enterprises always prefer Swift over Objective-C. 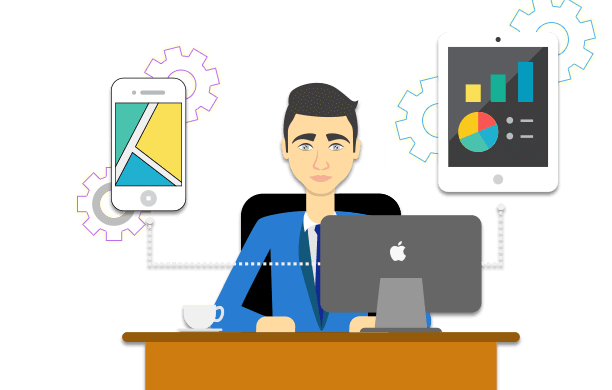 When it comes to custom iOS application development, the developers always have to analyze, assess, and review their choices. For years, Objective-C was the primary programming language for developing custom iOS apps. The Objective-C is fundamentally a superset of programming language ‘C’ with added object-oriented features and dynamic runtime. in 2014, however, Apple launched a new programming language called Swift which is also known as ‘Objective-C without C’. Swift is fast, safe, and modern. 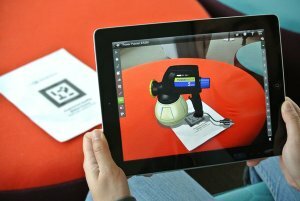 It also enables developers to establish a new level of interactivity in their custom iPhone app development. It consists of a number of useful features such as generics, closures, and type inference which makes Swift a lot easier to use and it also simplifies common patterns used in Objective-C. In simple words, Swift combines features of both C and Objective-C programming language without having direct built-in C compatibility and all constraints that comes along with it. Furthermore, iOS app developers can completely redefine their custom iOS app development using Cocoa and Cocoa Touch in Swift. Apple launched iOS Swift as a powerful and intuitive programming language for WatchOS, TvOS, and iOS app development, which can completely replace the Objective-C.
Due to its various key features, iOS Swift has the potential to become the only preferred programming language for creating scalable, flexible, engaging, and more user-friendly custom iOS apps. 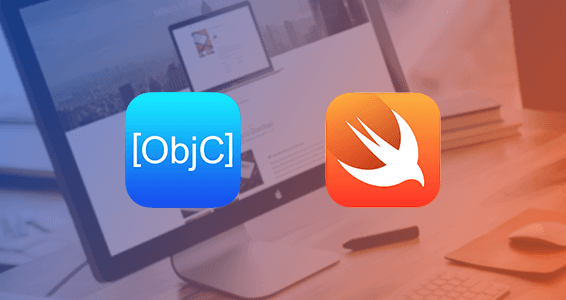 Now, before getting into the subject of iOS Swift vs Objective C, let us first give you a brief overview to the history of iOS programming languages. In 2008, Apple released the iPhone SDK 2.0. After its launch event, the announcement of Swift caused the revolution in the software development industry and gave the impulse to iOS application developers. During that time, during iOS mobile app development, there were real challenges as they had no experience with it before. However, in 2010, Apple announced the release of version 4 of the iPhone OS. This new version consisted not only new set of features, but also the changes in developer agreement. According to this new agreement, iOS developers must write applications in Objective C, C, and C++ to compile and link their applications against the documented APIs. Apple, then, continuously worked on Objective-C’s improvements for 6 years, until they developed and launched the Swift programming language. Swift is a modern programming language that provides a great speed and ensures real-time feedback. It can also be smoothly added into existing Objective-C code. In simple terms, the code written on Swift can work with code written in Objective-C programming language, within the same project. Although, there are two key differences between Objective-C and Swift they you must know. iOS Swift programming language is not a strict superset of the C language. This means, Swift is free to make use of syntax constructs. This basically allows developers to implement custom operators in Swift. Swift is dynamically typed. This means, Swift can take advantage of many of the recent advances in type systems. According to a stat by TIOBE index, Swift has nailed its position as the 11th most popular language. In 2015, Swift won the first place in nomination of “Most Loved Programming Language” in the StackOverflow Developer. 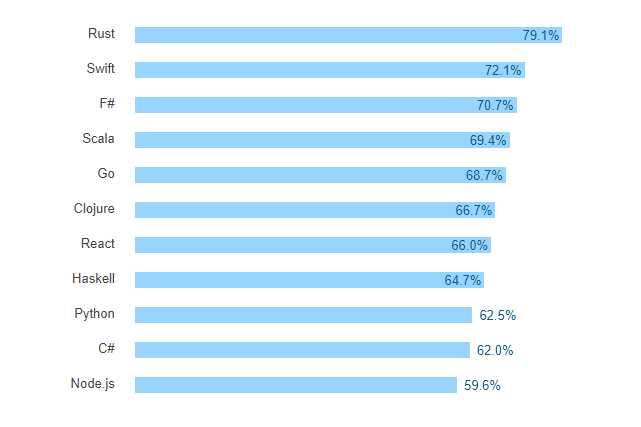 In 2016, Swift took the second place as “Most Loved Programming Language”, according to Stack Overflow Developer Survey. Swift is gaining popularity quickly. It is one of the fastest growing programming languages. In fact, more and more big brands are implementing Swift code into their iOS mobile apps. 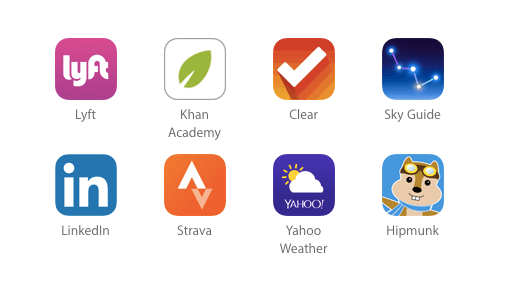 LinkedIn, Lyft, Hipmunk, and many others have developed or upgraded their iOS apps in Swift. VSCO Cam, a popular photography app for iOS platform, also choose Swift programming language to build its latest version. Point is, whether you’re a startup or an enterprise, you should know that Swift has all advantages to build a highly functional, best in class custom iOS app that can provide best user experience and customer satisfaction. After Swift’s big reveal, there was a lot of confusion in the development community as well as among tech startups and Enterprises that whether Swift is the better programming language or not. In fact, Swift has always been a centre of discussion among many organizations and experts as Apple claimed that Swift programming language was better than its predecessor. So to clear the confusion and explain why Swift is proved to be a smarter programming language, we’ve outlined 7 reasons why Startups & Enterprises prefer Swift for their iPhone Application Development. The number one reason to choose Swift is that of its clean syntax, which makes it easier to read, write, and modify. The number of code lines needed in Swift to developing iOS apps is much lesser than Objective-C. This is why startups and enterprise always choose to develop iPhone apps into Swift as it reduces the development time, thus – the development cost. For example, most iOS app development companies charge on the hourly basis, So by using Swift as your programming language, the overall cost of your project can certainly be reduced. Every app has an ongoing maintenance cost once it gets published. For instance, once your app is downloaded by your targeted users, you need to keep updating your app with new content, track how it’s performing, and integrate additional features to evolve it. However, many Entrepreneurs and Organizations and freelance iOS Developers who choose Objective-C for their iOS development projects don’t know that It’s not possible for Objective-C to evolve without C evolving first. Swift, on the other hand, does not possess these dependencies, which makes Swift a lot easier to maintain. For every startups and enterprise, building a secure mobile app is always number one priority. Swift’s syntax and language construction eliminate various types of mistakes possible in Objective-C. Therefore, build an iOS app by using Swift programming language, you can eliminate the risks that Objective C possess. With Objective-C, there are many issues which result in app crashes. Swift, however, provides code that is less error-prone due to its inline support for manipulating data and text strings. When you choose to develop your app with Swift, your developer will require writing less amount of code lines compared to Objective-C. In simple words, Swift requires less coding efforts to build apps for iphone, which ultimately saves a lot of time for your iOS mobile application development. Swift has various speed advantages over Objective-C during development, which results in saving on costs. Apple has made it evident that they’re dedicated to improving the speed at which Swift can run app logic. In fact, Swift’s performance approaches to the one of C++, which is known to be the fastest algorithm calculation arithmetic. Swift was announced as an open-source in 2015. This announcement opened up the potential to use Swift across a variety of platforms and also for the backend infrastructure. Open-source means that developers can give feedbacks to Apple to make improvements on a consistent basis to make it more structured and designed. This basically helps in developing future mobile applications. All these reasons justify why Swift is most loved programming language; there is one question, however, that we thought should be addressed in this article to help fellow Entrepreneurs to make the right decision. When you add Swift files into your Objective-C project, XCode will create a bridging header file for you. This bridging header file is no different than your existing Objective-C headers except for a fact that you only use it to import Objective-C headers you want to expose to your Swift code. This means a reasonable amount of time will be required to make the switch. The next thing we want you to consider is the size of your project. If your project is large, then it won’t lend itself well to bridging as Objective-C has leaky abstractions which will make the new Swift code less idiomatic. What About an OnGoing Objective C Project? Should I Switch It to Swift or Not? Again, this depends on numerous factors. The most important factor, however, for an ongoing project is to consider its urgency. If your project is urgent or has inflexible deadlines, then lean towards Objective-C temporarily. Once your app is published and has started gaining a good amount of traction, then you can later switch it to Swift when launching a new update. In Summary, we can state with complete confidence that Swift is the future of custom Apple app development. 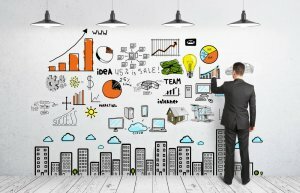 Startups and Enterprises, therefore, just need to have a clear concept and definite requirements for their Swift project. Also, apart from the custom Swift app development, Space-O specializes in the custom web app development. In case, if you have any query or confusion regarding developing iOS apps, swift app development or app development cost related to create an iOS app. Then, you can get in touch with us through the contact us form and one of our sales representatives will revert to you within 48 hours. The consultation is completely free of cost. This page was last edited on April 22nd, 2019, at 6:43. Want to Hire iOS App Developers To Build an iOS App With Swift? Contact Us Now!